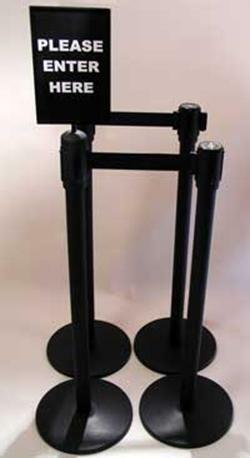 Our Retracta-Belt stanchions are an effective solution, found all across the country in schools and college campuses. Ideal for directing students in and out of lobbies and cafeterias, the addition of informative signage and directory boards adds further order and crowd management. Manufactured in the US, our made-to-order bulletin boards, including illuminated glass door bulletin boards, can be used to display important notices and are suitable for both indoor and outdoor use. Available in a wide variety of sizes, colors and materials to suit your needs, they can be mounted to a wall or a set of legs. Keep your schools organized and your students informed with products and solutions from www.CrowdControlExperts.com. CrowdControlExperts.com offers the broadest selection of stanchions, rope and posts, signage and crowd control accessories at discount prices. Visit us at www.CrowdControlExperts.com to view our full selection of stanchions and accessories or to speak with a Customer Service specialist, call 631-367-2005.